What a bad time it has been for the nation's best-known historians—that is, for the small number of historical writers, some affiliated with academic institutions and some not, whose books regularly inhabit the bestseller lists, whose faces frequently appear on television, and whose speaking fees reach well into the five figures. 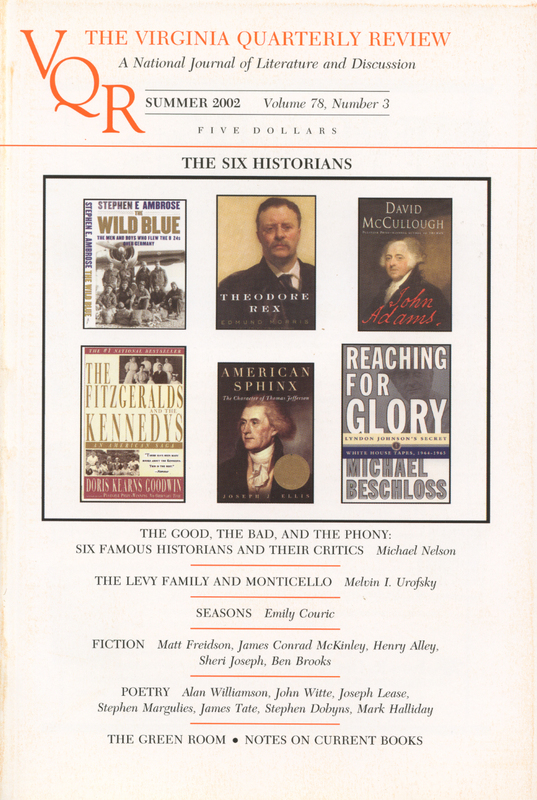 The entire roster consists of six people: Stephen E. Ambrose, Michael Beschloss, Joseph J. Ellis, Doris Kearns Goodwin, David McCullough, and Edmund Morris. All but Morris have recently been accused, in widely read publications and in some cases on talk shows, of offenses ranging from incompetence and superficiality to plagiarism and outright fabrication. Morris had his own spell of notoriety three years ago, when he published a "semi-fictional" (his term) biography of Ronald Reagan. Melvin I. Urofsky is Professor Emeritus of History at Virginia Commonwealth University, where he continues as director of the doctoral program in public policy.